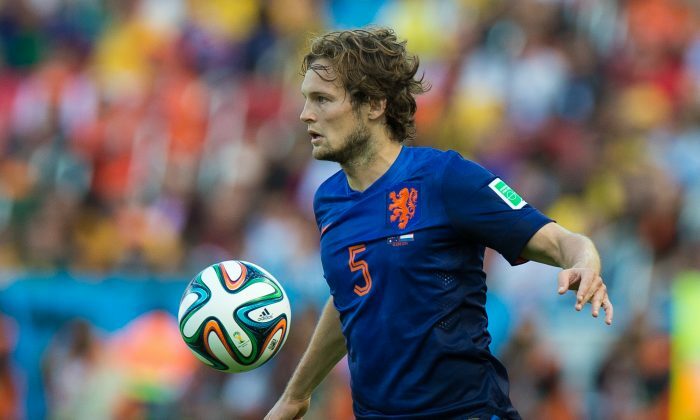 What are Daley Blind’s stats in a video game and in real life? Blind, 24, plays for Ajax in the Dutch league as a left back or defensive midfielder. In the 2013/2014 season, Blind made 29 appearances in the Eredivisie, scoring one goal and providing one assist. Blind also made 6 appearances in the UEFA Champions League, and 2 in the UEFA Europa League, according to WhoScored.com. Blind has a rating of 73 in FIFA 14, and a growth potential of 4 in Career mode. In Ultimate Team, Blind also has a 73 rating, but a 77 rating for his Netherlands World Cup and World Cup Team of the Month variants. Check out Blind’s Instagram account here. RIO DE JANEIRO (AP) — The World Cup semifinal could produce some split loyalties in the House of Orange. Dutch King Willem-Alexander and his wife, Argentina-born Maxima, could face some minor matrimonial tensions on Wednesday when the Netherlands takes on Argentina in Sao Paulo. At least that’s what photo manipulators on Twitter would have the world believe. Doctored images began circulating online as soon as the Netherlands completed its dramatic World Cup quarterfinal win over Costa Rica, setting up the semifinal with Lionel Messi’s Argentina lineup. One shows a couple lying in bed, facing away from one another, looking angry. The faces of Willem-Alexander and Maxima have been edited into the image of marital disharmony. Another shows the king and queen’s mansion in the wealthy village of Wassenaar draped in orange flags on one side for the Dutch and blue-and-white flags for Argentina on the other. The photos are fakes, but emotions could well run high when the king’s country plays his wife’s country of birth at football’s global tournament. The Dutch government information service confirmed in an email to The Associated Press on Monday that the couple will not fly to Sao Paulo to watch the match. Publicly, at least, Maxima is a fervent fan of her adopted country. Earlier in the tournament, she joined her husband in Porto Alegre to watch the Netherlands gritty 3-2 win over Australia — a match at which the naturalized Dutchwoman Maxima unabashedly cheered on the team and visited the changing rooms afterward to congratulate the players. Photos showed the royals, draped in orange scarves, with the players and congratulating midfielder Wesley Sneijder on his 100th international appearance. Born and raised in Buenos Aires, Maxima is the daughter of a former agriculture minister in Argentina’s 1976-1983 military dictatorship. She met the then-prince Willem-Alexander while she was working as a banker in New York. The couple has three daughters. The vivacious Maxima, who speaks fluent Dutch, has been credited with giving the sometimes dour prince a popularity boost by injecting a touch of Latin flair into the royal family. The prince, a former member of the International Olympic Committee, has long been a regular fixture watching Dutch athletes, from footballers to speedskaters to field hockey players, in action. His wife has enthusiastically joined in since their marriage in 2002. If the Dutch manage to beat Argentina, don’t bet against the royal couple being in the Maracana for the World Cup final — their official diary is clear from July 9 through to July 17.